The meeting of the “Vancouver Group,” comprised of the states which made war against the Korean people in 1950-53, took place on January 16 in Vancouver. From the point of view of its stated aim – to find a diplomatic versus military solution to the crisis on the Korean Peninsula – the Vancouver meeting was as unproductive as expected. It could not have been otherwise given that the participants did not include the Democratic People’s Republic of Korea (DPRK), which is the target of UN sanctions that the meeting sought to strengthen, nor China or Russia, two parties which border the DPRK. The “Vancouver Group” seeks to circumvent the UN Security Council, which is still regarded as the organization entrusted to safeguard world peace, and the UN General Assembly, which is said to represent all the countries of the world. Canada and the U.S., as co-hosts of the meeting, Japan, the Republic of Korea (ROK) and Britain spoke at the opening press conference in the most hooligan manner. All in all, the summary produced by the co-hosts after the meeting merely shows how vengeful they are and that the fight of the U.S. to impose their control on the situation is not only genocidal but that it poses ever greater dangers to the cause of world peace. She then gave the imperialist line of peace through strength to serve what is deemed to be the national interest of countries thousands of miles away without regard to the fact that these countries attacked Korea in 1950, using weapons of mass destruction at that time. In the case of Japan, which is next door to the Korean Peninsula, this is a country that committed grave crimes against the Korean and Chinese people and other peoples of Asia during World War II whom it has never compensated. On the contrary, it is now claiming the DPRK represents the biggest security threat to Japan “since WWII.” This as it praises its criminal actions in WWII while coming forward to repeat them. Any incident is assailed as “North Korean aggression” and then used to justify continued U.S. presence on the Korean Peninsula as well as provocations to scuttle attempts at dialogue towards re-unification. The Cheonan case in 2010 is but one example of many where the DPRK is accused of aggression, even terrorism, based on lies to prove fairy tales and hide the crimes of its accusers. In March 2010 the south Korean navy corvette the Cheonan that was part of a naval formation participating in joint south Korea-U.S. war exercises sank in the Yellow Sea. Over 40 of the 104 personnel on board perished. The U.S. and south Korea claimed the ship had been hit by a torpedo fired from a north Korean submarine and used this to institute a number of new hostile measures and threaten the DPRK with war. The DPRK said the claim was a fabrication. Subsequent investigations by experts did not substantiate the claims of the U.S. and south Korea. The thrust of the opening remarks made it clear that whatever was to be “discussed” at this meeting will have disastrous consequences for the cause of peace and the peoples of the world must speak out with all their might. 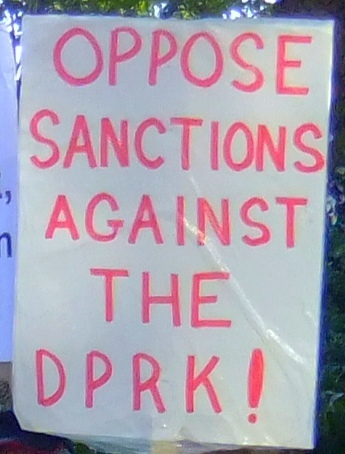 The naval blockade and sanctions regime must be opposed and support must be voiced for the inter-Korean peace process and demand that the U.S. sign a permanent Peace Treaty with the DPRK and get out of the Republic of Korea and surrounding seas. The narcissism of those who attempt to criminalize the DPRK for so-called covert trafficking in weapons and other criminal activity is such that they forget they are speaking about themselves, not the DPRK. The U.S. is the biggest arms trafficker in the world and they engage in buying and selling arms as normal business in today’s world. 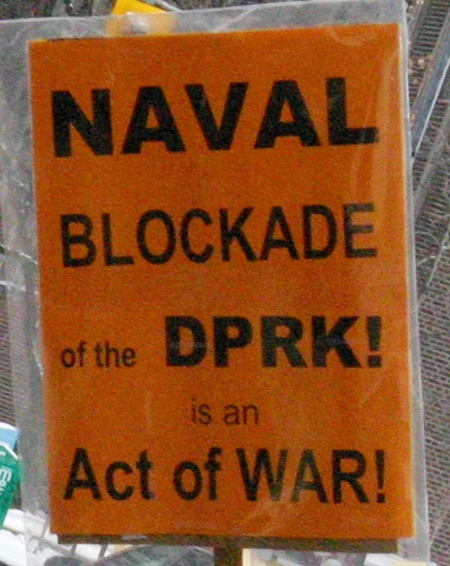 To portray the DPRK as if it were some kind of narco-state belies that it was former U.S. President Ronald Reagan who presided over the Iran Contra scandal, where drugs were sold for weapons to illicitly establish the mujahadeen in Afghanistan and defeat the Soviets; or the evidence that the U.S. Drug Enforcement Agency is involved in the Mexican drug cartels to cause chaos in Mexico for nation-wrecking aims. undertake preparatory efforts to outline principles and requirements for a verification mechanism sufficient to guarantee the complete and irreversible dismantlement of all of North Korea’s WMD programs and related delivery systems. Ultimately the meeting did not resolve any matters nor establish any legitimacy for whatever it is the U.S. with the aid of Canada, Britain and Japan in particular are preparing to enforce next. Reports and editorials on the meeting all express confusion as to what was achieved as well as concern over the consequences of sanctions or a naval blockade. Calling sanctions voluntary hides what this means. The U.S. blockade against Cuba with its extraterritorial provisions shows what voluntary means when companies and other entities that may not agree with the U.S. blockade are hit with fines and prohibitions if they deal with Cuba or Cuban entities. It is worth noting here that one of the things meeting participants agreed to was taking steps to impose unilateral sanctions that go beyond those required by UN Security Council resolutions. Some note that if the aim was diplomacy and peace, so long as the DPRK, Russia and China are not in attendance, this is unproductive. 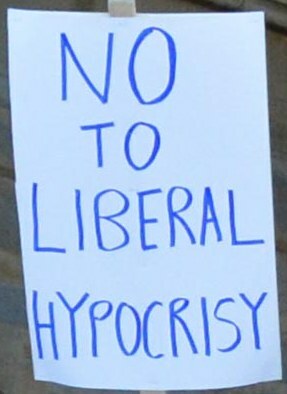 One need only look at the bellicose and inhumane actions they call for and already are taking against the DPRK and its people, which they refer to as “diplomacy” to see that the meeting had nothing to do with diplomacy, let alone peace. Neither are the U.S. and Canada talking about peace when they say their aim is “denuclearization.” The denuclearization of the Korean Peninsula is a profound desire of the Korean people, the American people, Canadians, Brits, the Japanese and peoples of the world who want peace. But the more the U.S., Canada, Britain, Japan and supporting actors reveal to the world through their actions that their aim is not peace, the more their talk about “denuclearization” leads people to question what they are talking about. What kind of denuclearization is it that does not include the United States, which is the only country that has ever used nuclear weapons and is armed to the teeth with nuclear weapons and other weapons of mass destruction on land, sea and air, and uses them to target Korea, China and Russia, amongst others. Schemes to control the Korean Peninsula so as to control China and Russia which, to boot, greatly endanger the cause of peace, are not what the people consider working for peace. Not a word was uttered at the meeting about what the Korean people want, which is inter-Korean talks without foreign meddling, peaceful re-unification of their nation and an independent Korea. The countries attending this meeting may believe that the aim of “denuclearization” forgives everything but it does not. The U.S. nuclear power’s demand for denuclearization coupled with its branding of DPRK as aggressor does not have to do with ending the use of nuclear weapons but with who has a monopoly on first strike. News analysis and media reports are proposing all kinds of alternative ways to treat the Korea crisis but most of them are framed by Cold War premises, many falling for the trap laid by the U.S. president who is trying to establish a “tripolar” balance between the U.S., China and Russia. Suggestions are being made that Canada’s role should be to come to terms with China as concerns North Korea to serve its national interest and as an alternative to dependency on the U.S. This too is a path which people need to discuss so as not to fall into the trap of thinking that peace can be safeguarded if only proper alliances are made. In this regard, the reference point most often accepted is the tri-polar division of the world based on playing off the geo-political interests of China against those of the U.S. and Russia versus those of Russia against the U.S. and China or those of China and Russia against those of the United States. This is a dangerous game and is not the road to peace. A new equilibrium can only be established in international affairs by the peoples of the world affirming their desire for peace in effective ways by standing for what they want, not positioning themselves within what the imperialists and big powers want. 1.“Truth behind Cheonan Incident: U.S. and Lee Myung Bak Group Fabricate Ugliest Conspiratorial Farce in DPRK’s History — Inspection Group, DPRK National Defence Commission,” October 2010,” TML Daily, November 5, 2010. 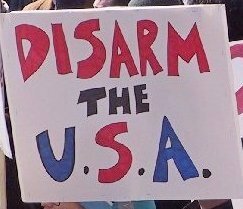 2.According to studies conducted by Stockholm International Peace Research Institute (SIPRI), the U.S. was the world’s largest arms supplier during the period 2012 to 2016, accounting for 33 per cent of international arms exports. Saudi Arabia, the United Arab Emirates (UAE) and Turkey were listed as its biggest buyers. The UAE, which ranks among the top 15 arms spenders in the world according to Business Monitor International (BMI), is an active aggressor in the Saudi-led and U.S.-backed “coalition” waging war against the armed resistance of the Yemeni people. Turkey, a NATO member, has long served as a base for U.S. aggression and illegal activities in the region, including attempts to destabilize Syria by arming terrorist forces to wreak havoc in the country. In the final days of 2017, Canada announced its own new Defence Cooperation Agreement with the UAE. In December as well, around the same time the U.S. authorized sending new lethal weapons to Ukraine, Canada added Ukraine to the list of countries to which it may sell light weapons. Ukraine is currently engaged in a civil war in which the Canadian government backs the government forces that usurped power through a coup, using Georgian military officers and some Lithuanians as snipers — to massacre people in Maidan Square, and the fascist paramilitary forces allied to it. Canadian arms manufacturers will now be able to sell their weapons to other countries or paramilitary forces through Ukraine, itself a major arms merchant, which they might not otherwise be able to do because of Canadian export restrictions and public opposition. 3.The Adverse Consequence of Economic Sanctions, Marc Bossuyt, June 21, 2000. To see full report, click here.